Anyone who has been managing website security for the past few years has been following the long phase out period of TLS version 1. We are moving to TLS version 1.2, as TLS 1 is no longer that safe. TLS beats SSL, people still confuse both, but TLS stands for Transport Layer Security and SSL stands for Secure Sockets Layer. For the past few years, there have been deadlines for webmasters to upgrade from TLS 1 to TLS 1.2 but those deadlines have been pushed off time after time. 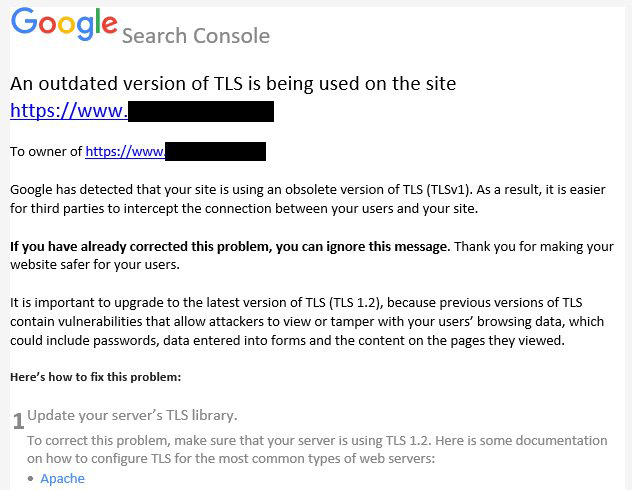 It looks like the final deadline for that upgrade is March 2018 and thus, it seems Google has started to notify webmasters that are running TLS 1 to upgrade to TLS 1.2 via the Google Search Console notification system. I have yet to receive any notifications but I expect to see some. The issue is, TLS 1.2 is not supported on legacy browsers and some people still use older browsers, sadly. So many sites are holding off until the last possible minute to do the upgrade as to not exclude 1% of their customers or users. Have you upgraded? If so, did you see any decline in any analytics you track?